Today I bring you a little insight into the development and concept behind Ouroboros. Many thanks to Nicola for providing such intriguing answers in this interview! I tried to use my established methods of working – through multiple objects, and the collection of words and messages- and come up with an inventive, playful way of applying that to a sports-related object. There is something about the ping pong ball that appeals to me – its orb-like, simple form is almost organic if you imagine seeds or microscopic cells. The spheres are also fantastic at diffusing light so this made them the perfect material to transform into a luminous spectacle at night time. It also links into my method of working and my own obsessions – that is: working with many small objects that make up a whole, my love for circles and spheres, and evolving my previous work with seeds, to find a ‘seed-like’ sports visual. Sports objects have been used in many artists’ works before, such as the three basketballs in Jeff Koons’ Equilibrium tank. Lee Wen did a fantastic ‘re-invention’ of the ping pong table in his work Ping-Pong Go Round. Could you tell us a bit more about the term ‘Ouroboros’? What does it mean? Ouroboros is an ancient symbol, signifying the infinite cycle, the circle eating its own tail, or the rebirth and life cycle. It is sometimes represented by a snake which also references that inevitability of life: death, and the life that is reborn from this. I was very interested when I found out that the symbol has been found independently in many ancient cultures – Norse legend, Egyptian texts, Greek mythology, Indian symbology, South American cultures, as well as in alchemy – even Chinese alchemy where more commonly the ouroboros is seen as a Taoist Yin-Yang symbol. Why did you decide to use such a symbol for this project? I prefer to stick to the pure geometric shape in this work – to me it is simple but with complex meaning. It allows the sculpture to symbolise society, progress, and the pace of life, as well as deeper themes. Originally I was working on some mapping equations to use the path of an arm throwing a ball to create the shape and swoosh of the sculpture’s form. However it became too complex and unbalanced as a structure, so we had to simplify, which in the end created a stronger visual. The idea for Ouroboros is to engage the public with writing their aspirations on the pingpongs- are there any particular age groups that you targeted? I worked with mainly students and youth to write the aspirations, and my community partner IQ Kidz specialises in art programmes at schools so we had a fantastic and diverse reach thanks to their kind help. This has helped the artwork genuinely connect with a massive and diverse range of people. It was an exciting prospect to know that so many young minds could be engaged, because this gives a true sense of aspiration – not adults longing for the things they have not done (which we are all guilty of! ), but children and young adults who genuinely are working towards making these dreams come true. Another bonus of working with younger people is that imaginations, honesty and unexpected insightfulness were frequently apparent in the messages. Some of the most exciting and poetic sentences were written by toddlers at Wee Care school (with the kids conjuring up aspirations and teachers helping write), as the sky is the limit to their imaginations. We had “I want to be a blade of grass”, “I want to be a mummy giraffe”, “I want to be a ninja turtle”, “I want to be a police woman”, “I want to build doors when I grow up”, “I want chicken”, and “I want to be a sun” – each of these wishes, I am sure, sound equally as possible and wonderful to those young minds! That’s beautiful! What do you hope that the public will take away from the experience of viewing and interacting with your sculpture? I hope that people will read one or two messages, and I secretly hope that they will become so intrigued by people’s words that they will get caught up in reading a whole swathe of aspirations! Ultimately it’s not up to me to prescribe what the viewers take away – I’d rather present something interesting or meaningful, and see what reactions come. Personally, my reaction to it is that it’s wonderful to see such ambition in young people, that it’s compelling to see the difficult truths as well as heartfelt dreams in some of the more poignant wishes, and that we can catch a glimpse into our community and into humanity by taking time to read these messages, to connect, and listen to other human beings. For my participants, I hope that perhaps through writing on Ouroboros, they may gain more determination and optimism to make those wishes reality. Were there any project hurdles that, in the end, contributed to the development of Ouroboros? I am a true believer that the more times your idea gets challenged, the more you refine it and the better it is for those hurdles. Some of my best works were the ones that overcame many barriers. If you were to write an aspiration on a ping pong for the sculpture, what would the message be? I will have to think more about this! I have a lot of aspirations so I may need an outsized table tennis ball! Haha, fair enough! Is there anything else you would like to add? Many of my artworks are made up of small fragments that make a whole that is “greater than the sum of its parts”. In a way that could be applied to people. When we work together as a team or family, we can achieve extraordinary things. 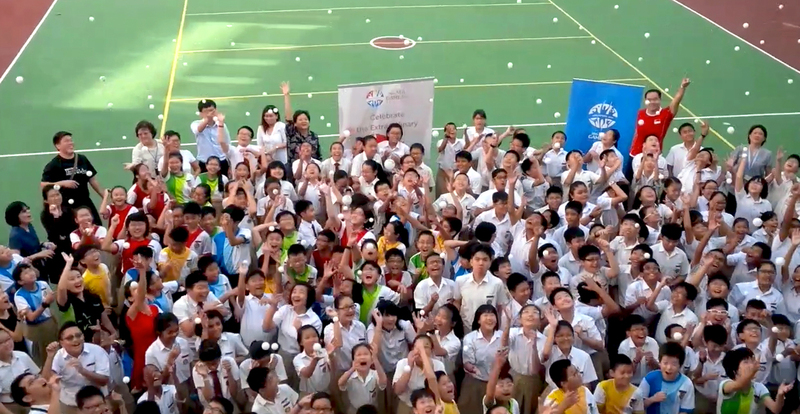 This seems to be a connecting factor between the message of SEA Games, the essence of sportsmanship, and my own work.